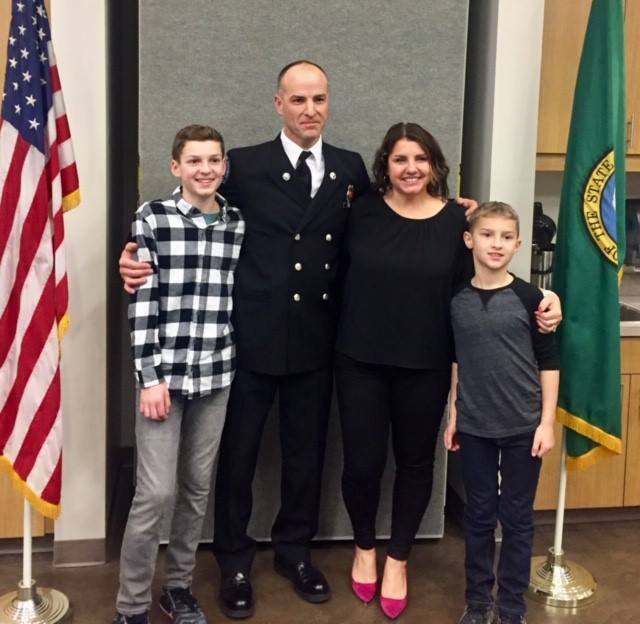 The Northshore Fire Department promoted one of its firefighters during a badge pinning ceremony on Tuesday, February 5th. Ryan Davis' promotion to the rank of Lieutenant came after serving as a firefighter for the last 17 years. Lieutenant Davis joined the department in 2002 and has served as an Acting Lieutenant for the last nine years. Chief Torpin conveyed the organizational importance of the Lieutenant position and spoke highly of the efforts and preparation Lieutenant Davis put into achieving this career milestone. The promotional ceremony was well attended by Ryan’s family, friends, and numerous members of the fire department. The formal badge pinning was performed by Ryan’s wife Michelle and their two sons Luke and Cole.